For our first Pack evening of December, as we did last year, we got ourselves into the Christmas spirit by taking the Cubs to see the Bodicote Player’s pantomime production of Rapunzel. Rapunzel is a story about a beautiful girl with long golden hair who was imprisoned from a young age in a tower with no door by a wicked Witch but eventually rescued by a handsome Prince. It was a story that not many of the Cubs knew but they were soon enthralled by what was taking place on the stage and had a wonderful evening, taking every opportunity to join in with the cheering, calling and booing when required. On this Pack evening, after our successful visit last year, we had been invited back to sing for the elderly Residents of the assisted living flats at Foxhall Court and retirement flats at Merisham Court. The flats are just up the lane from our Headquarters so we look on the Residents as our neighbours. The Cubs, all looking smart in their uniforms and Christmas themed hats, congregated in the dining room of Foxhall Court, where the Residents had just finished their dinner. It was a Christmas sing-a-long with all the songs brilliantly sung by the Cubs. The Residents wanted more so we also ended up singing some camp fire songs for them, with some of them joining in as well. After the singing, and squash and biscuits provided by the staff, the Cubs circulated around the tables to talk to the Residents, who were delighted to talk to the Cubs and ply them with mince pies. The Cubs made us proud with their singing, behaviour and manners – and they have got another invitation back for next Christmas! 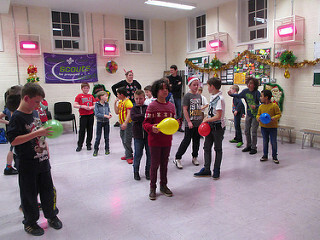 Traditionally, the final Pack evening of the year is for our Christmas Party, and this year was no exception and marked the start of our two week break from Cubs for the festive period.